If you haven't had the pleasure of visiting My Ghoul Friday, you really must check it out. 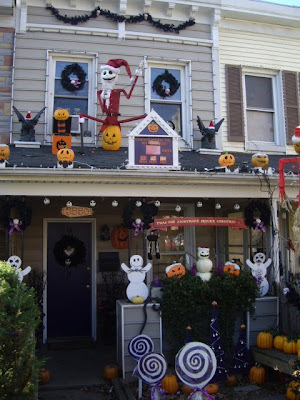 I'm just beginning to explore the creepy goodness of true Halloween aficionados. There are so many! What Would Fall Off The Roof First? 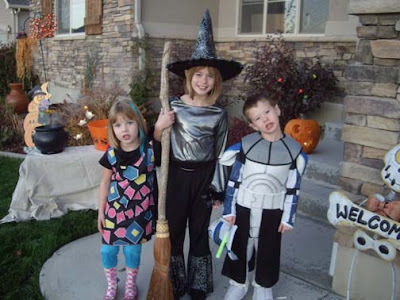 My brother's grandkids are a hoot! They're all quite shy until they get to know you. My husband is a big guy, and they pretty much steered clear of him for a long time. He kept trying to break the ice, and finally figured out that they love to be challenged with questions! He would ask them simple math questions and trick questions like "Which is heavier, a pound of rocks or a pound of feathers?" They love it! They can't get enough of it! "Uncle Joe, what would fall off of the roof first, butter or a giant watch?" My family is warped. And I admit freely that I am a special sort of super warpiness. Last summer my mom decided to get a couple of white-haired wigs. She thought her hair was too thin to be beautiful any more. When they began to feel hot and itchy, she was easily won over by our reassurances that she was still beautiful. Her will stated that she would be cremated, and, since I'm a ceramist, I decided to make the urn myself. I'll be doing one for my father's ashes as well. So the least expensive container for the ashes is a heavy duty, black plastic box. As I was gathering her lovely clothes to take to charity, I saw that she had kept the wigs. Well, it occurred to me to place one of them on her box so we could smile at her instead of feeling sad each time we saw the cold, impersonal box. My daughter, who may someday get her PHD in super warpidity, suggested that I put googly eyes on the box. I thought Mom would find that hilarious, but was concerned what visitors might think. Not really, actually, if I had the googly eyes, I would have done it. My nephew, bless his heart, is a big warpy soul. One of my fun Halloween things is a big plastic knife that plays the screechy shower scene music from the movie Psycho. You can this where this is going, right? 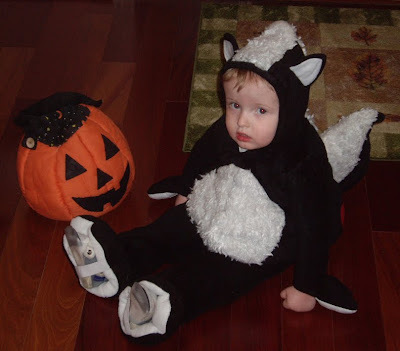 As I was out front preparing for trick-or-treators, he ran out of the house with the wig on holding the screeching knife high. I screamed and then I had a good belly laugh! I'm still chuckling about that. I think Mom would have appreciated that. What a beautiful Halloween it was! The weather was perfect! We had a party on Friday, just the family. 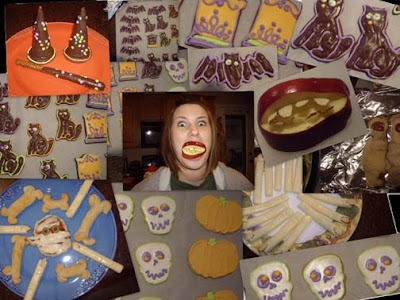 We made kooky treats for dinner, Mummy Pizza, Mummy Dogs, String Cheese Fingers, Bread stick Bones and Apple Bites. Most of the recipes and instructions came from this year's Better Homes and Gardens Halloween magazine. And I made way too many cookies, but that's just me. The kids each got a witch's hat and wand - A sugar cone covered in chocolate (I used a pastry brush to coat the cone in melted chocolates) and a chocolate covered pretzel sticks, both sprinkled with confection stars. I LOVE the picture of my niece, Adrienne with the Apple Bite in her mouth! It really tickles me! The sunset Friday night was so amazing! 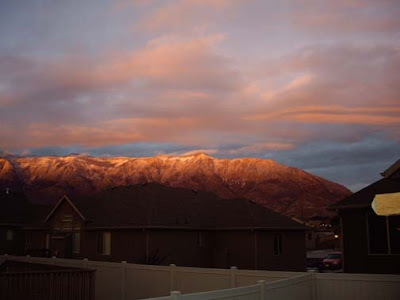 This is the view from our deck. And Halloween was just the best! It seems like it's been a long time since I've had that much fun. We all needed it. This is me ready to greet my trick-or-treaters. I was so excited because I lived on a semi-rural road in Maryland. 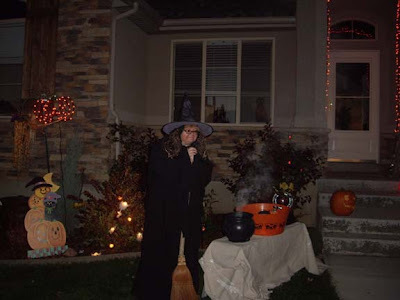 I haven't seen trick-or-treaters for five years! These are two of my grandnieces and my grandnephew. So cute! This is Evalyn, my first granddaughter. And, next is my youngest granddaughter, Alessia. Then, My oldest grandchild, Alex. This one is from the year before last, I just love it! I miss them so much! The next door neighbors carved some Nightmare Before Christmas pumpkins! They're really wonderful! Yeah, I want to live there. 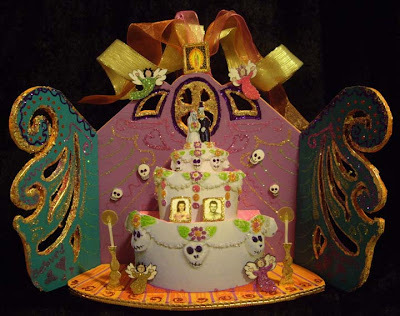 So, the Crafty Chica (http://www.craftychica.com/) had a Day of the Dead Shrine contest and I was so excited about it! I knew I would enter, but had no idea where to start. My dad died in May. He was a rocket scientist, so I had visions of rocket ships and skeletons. I just kept mulling it over. Then, last week, my mom passed away in her sleep. The ceramic cake box jumped into my mind while I was laying in bed on a sleepless night. I decided to use a photo of the cake as a place to start. I printed three different sizes and pieced it together on foam core board. 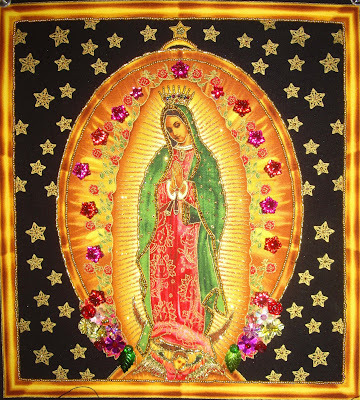 I used printable, white and clear shrink plastics for the photos of my parents, the candles, skulls and angels as well as a photo of a beaded Virgin of Guadalupe. I did the beading with some instruction from my buddy, Beth. Check out her web site, it's awesome! (http://sparklingsoulstudio.com/default.aspx). When the glitter came out, that was all she wrote. It's everywhere now. I'm not sure I'll ever get it cleaned up. I'll be blowing glitterboogers for a week. Phyllis Dobbs created a fun and easy Halloween mask - great for adults and kids! Stephenie Hamen accessorizes plain paper lanterns with her paper punches. Pattie Wack uses 3-D paint to create chokers that will creep out your party guests! Vanessa creates an inspired wreath made of tulle! Amy of Living Locurto shares a slew of fun ideas to host your own Mad Scientist Party. 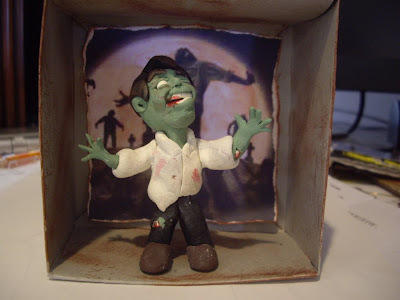 Crafty Chica shows how to add some zombie love to your decor! 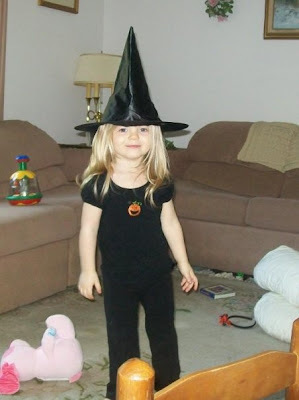 Boopsie Daisy shares some of the wonderful Halloween dollies that she dreams up! 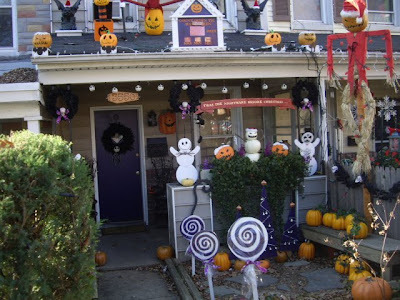 Kathy Cano-Murillo shares a haunted crafty tale! 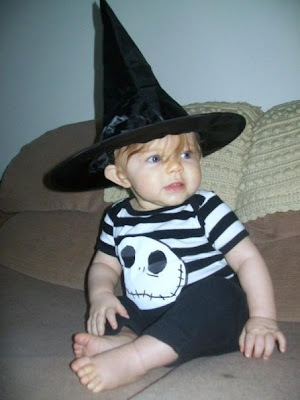 Make these cute little paper cone witches for Halloween! Mel takes the leftovers from last week's project and makes a cool Goth choker! Margot creates another spooktacular mixed media necklace with a bite. Heidi Borchers creates a super cute windchime with personality! Add some Halloween flair to your day with this cute kitschy bracelet and earring combo! Studio Mama makes a strong impact with these quick and easy tags! Sharron Westerfield shares her passion for costume-making and the joy it brings her grandchildren. Swelldesigner a.k.a. 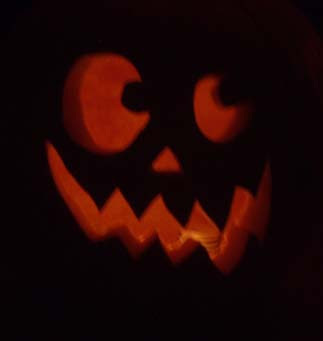 Alexa Westerfield shows you how to make a fun pumpkin on the fly! This is my parents' wedding picture. That was 1949. 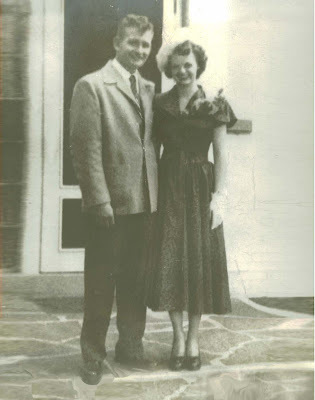 My dad passed in May, just short of their 60th anniversary. Mom passed this week. They were wonderful, loving parents and we will miss them. Tuesday is date night for my hubby and me. 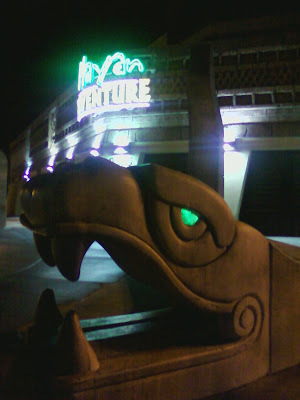 Last night he surprised me with dinner at the Mayan Adventure in Sandy, Utah. 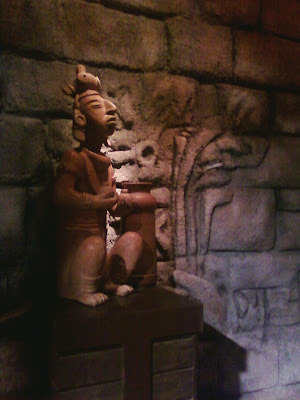 It's a very cool theme restaurant with temple carvings and cliff divers. It's hard to tell from this picture, but all the tables are in view of this cliff set up. When the divers are doing their bit, there's water falling all over it. 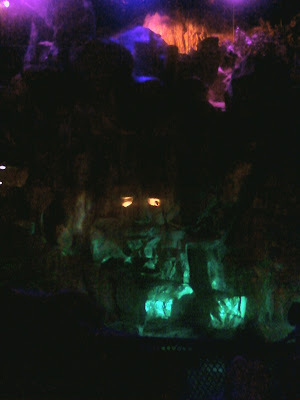 When there's nothing going on you can see a face carved in the stone, with glowing eyes. Here's our dessert. 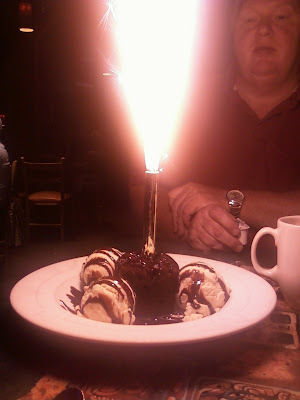 A chocolate explosion cake! Yum! 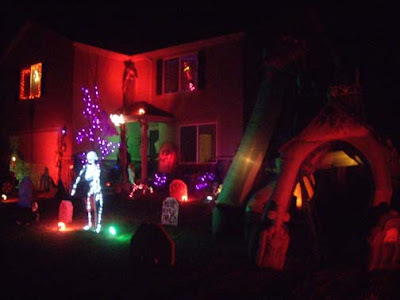 Silvia creates a miniature haunted house that is spooky and oh-so fun! Vintage plastic owls become the focal point of a charming necklace you can wear for Halloween and all year round! 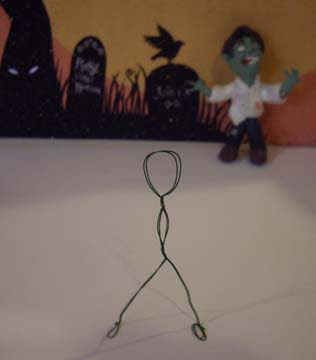 Make a creepy wire tree just in time for Halloween! Adorable little folding shrines that fit in your pocket! 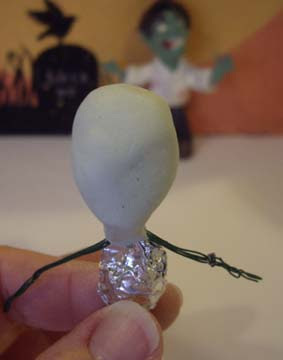 Make a plump paper pumpkin from some strips of paper plus a little Halloween craftiness! Candace's diabolical plan to populate the world with zombies continues! Make a retro style styrofoam ornament into a fab Halloween Party centerpiece! Madge shows you how using iLoveToCreate products! Come make a spooky spice rack with Crafterella, she's sharing her unique labels with everyone! Conjure up a quick Halloween cupcake basket using new ScoreBoard dies! A little scary, a little fun, this delightful banner celebrates all things Halloween. Made using Brenda Pinnick Sizzix dies, glitter and ribbon. 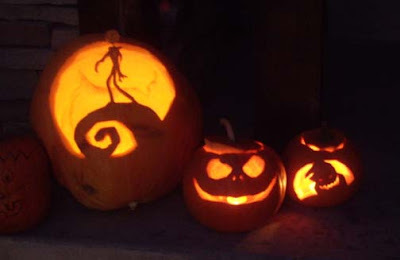 Pattie Wack turns mini pumpkins into a boo-tiful Halloween lighting idea! Turn off the lights and have a laugh with this goofy wall hanging from Alexa Westerfield! 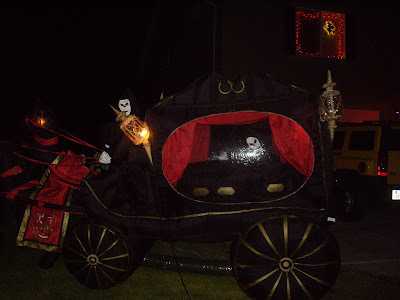 Vanessa Coppola turns a traditional pumpkin into a decopauged masterpiece! 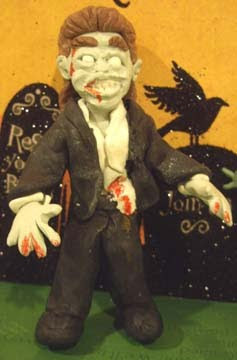 This is a polymer clay zombie that I made for my dear friend, Beth. 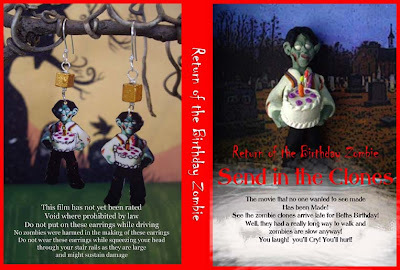 She and her family love zombie movies, so I came up with an idea to make the gift as cheesy as a great zombie flick. 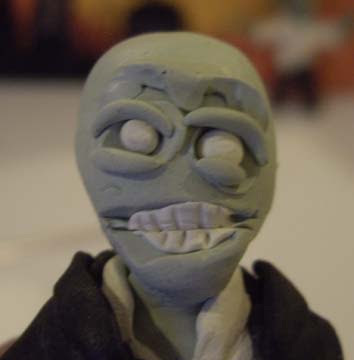 I made the zombie using polymer clay. 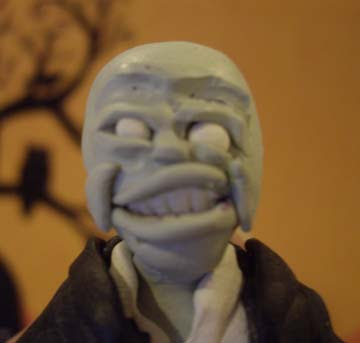 See the Polymer Clay Zombie blog entry from last week's Terrorific Tuesday post to learn how to make your own zombie. I made him one half of an Origami box to stand in, but you could use any box. I used some Photoshop techniques on a photo I'd taken of a graveyard for the background. I tore the edges and browned them up with a sienna stamp pad and glued the pieces to the back and sides of the box. Next I composed the following letter to go with it. If you're a zombie officianado you'll see where this is going. If you're not, I'll say this: George Romero made the first zombie classic Night of the Living Dead - It takes place in a small town in western Pennsylvania - If you're bitten by a zombie, you become one (some consider this the Zombie Virus) - Where ever zombies go there is mayhem - The most famous line from the movie is "They're coming to get you, Barbara". You should know there’s been a terrible virus going around our town. None of my staff showed up at all today. Barbara started your cake, but couldn't make it in either. There are several fires in town and things are a mess. I called my delivery guys, who said they could go pick her up. I called her and said “They’re coming to get you, Barbara”, and she screamed and hung up. She never showed and I can’t get hold of the delivery guys, either. I’ve finished the cake myself and will deliver it personally. I hope it will meet your approval. So, in the process of moving to Utah and, yes, that's my excuse - I missed Beth's birthday. 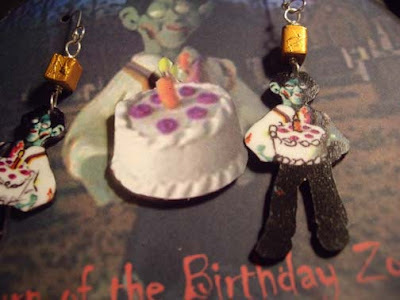 As I was putting together ideas for Alexa Westerfield's Terrorific Tuesdays, I printed photos of the birthday zombie and made them into earrings. See the SugarSkull Bracelet & Bats in the Belfry Necklace, and Candy Corn Riot Earrings blog entries, if you want to use this idea. They have all the directions you might need for shrink plastic and earring making. With one exception - to make your earrings from a photo, you'll need the inkjet printable shrink plastic. RETURN OF THE BIRTHDAY ZOMBIE. 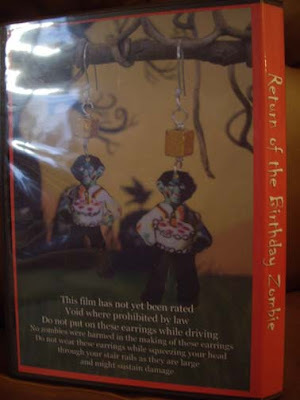 Now, I was looking around the house for a box to send the earrings in and then it hit me - I had some old DVD cases that I'd been saving for some scathingly brilliant idea, and finally I had one! 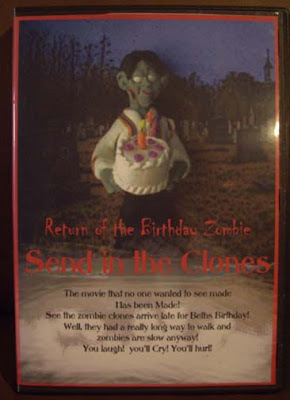 See the zombie clones arrive late for Beth's Birthday! Well, they had a really long way to walk and zombies are slow anyway! You laugh! you’ll Cry! You’ll hurl! 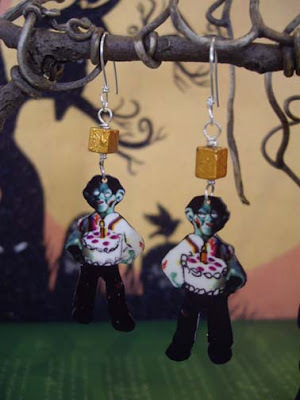 Do not wear these earrings while squeezing your head through your stair rails as they are large and might sustain damage Here's what you'll need to make your Zombie (or any kind of) Movie Gift Box. If you don't have a printer at home, make copies at the library or neighborhood copy store. Make extras for good measure. Speaking of measuring, you'll need the measurements of the DVD case. This can be done easily by taking the paper out of the DVD cover and measuring it. Easy peasy! I did mine with Photoshop, but I could just as easily done it as a collage. Just make sure that the collage will easily fold to slip into the DVD case, if you choose this option. For the DVD, place a disc on your extra copy and trace around it. Cut the copy giving a bit of extra margin to trim. Now smear a thin coat of Aleene's Quick Dry Tacky Glue on the disc and put your cut image on it. Trim the edges with a craft knife and cut out the center hole. Punch two holes to put the earrings through (if you're doing that) and tape the backs, so the earrings won't slide out. Ohh, I just had an idea! Since the center of my DVD that got cut out was a cake, I decided to add it back. 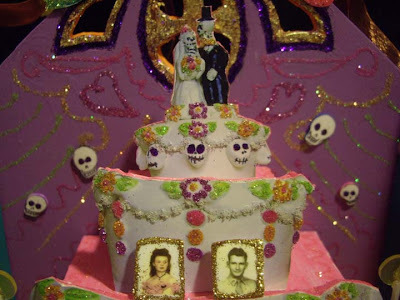 I got another copy of the photo and cut loosely around the cake. Next I used a double sided craft tape to stick the cake to a piece of card stock. 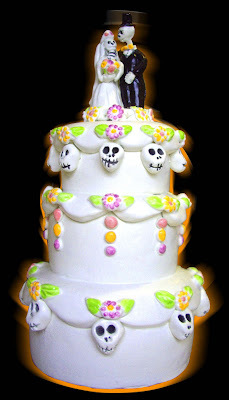 Then I cut the cake out and used a sticky craft dot to attach the cake to the image just below the hole. 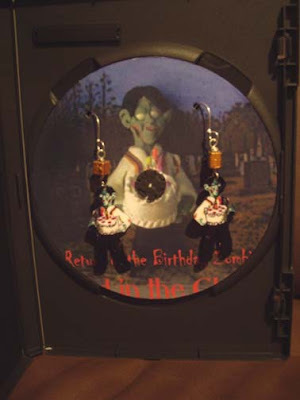 Since the earrings are taped on the back of the disc, I want Beth to be able to take the disc out of the case. She'll press on the cake to release the disc! Now, go! Go make your DVD case gift box! 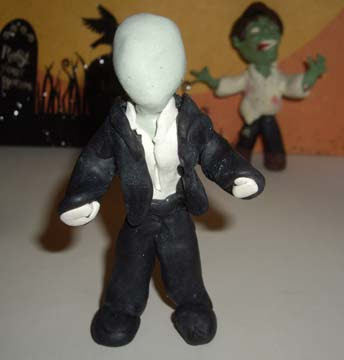 You're welcome to use the zombie letter and figure ideas, if you like! Oh no! The zombies got to Earl the Squirrel while he was in his day job clothes! 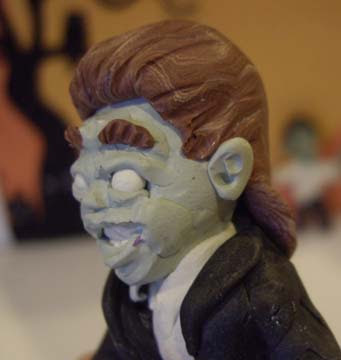 Earl would be mortified if he realized...you know, he always thought he'd be a cool looking zombie with his mullet and ACDC t-shirt. But, no. No cool zombie image for the Squirrel. My buddy Cindy turned me on to a book by Maureen Carlson called Fairies, Gnomes and Trolls. The instructions and tutorials are awesome! 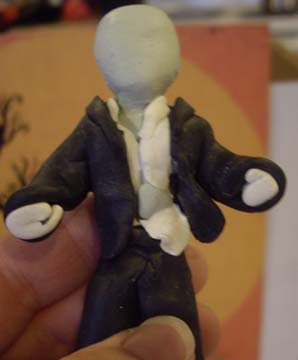 So, I was doing a polymer clay class for my friends, Laura and her way cool son, Tommy. I think we were making canes. 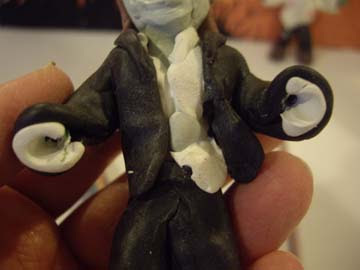 Anyway, at the end of the class, Tommy made a tiny Freddy Krueger from the leftover clay. 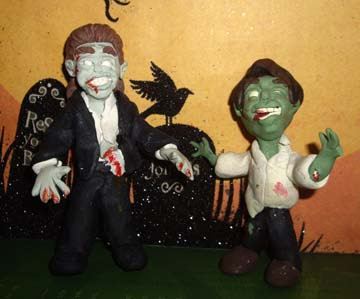 We decided they should come back and do a zombie making class! We used the same methods that Maureen Carlson shows in her book and it was way too much fun! We were joined by fellow zombie enthusiast and dear friend, Beth. 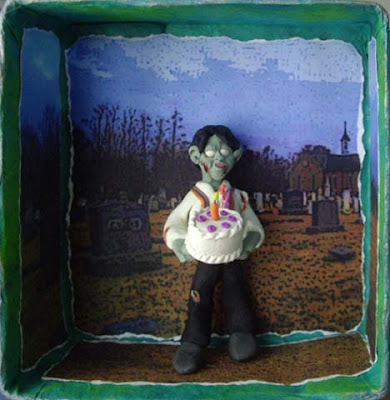 I had made a birthday zombie for her which I'll feature in another blog. Standing in the back ground here is the Elvis impersonator zombie. A means for baking the zombie - a toaster oven reserved for crafts or a conventional oven that you only use for crafts occasionally. Begin by folding one 18" piece of floral wire in half and in half again. Twist an opening in the middle of the wire for the head, a little further down twist an opening for the body and fold a small amount of wire on the ends for feet. If you can make it stand on its own, you're off to a good start. If you can't, don't worry the clay feet will still work. 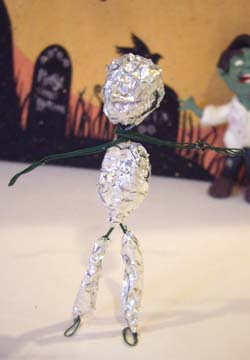 Crumple bits of foil and wrap around the head, body and legs. Fold the other piece of floral wire the same way you did the first piece and wrap it around the neck a couple of times. 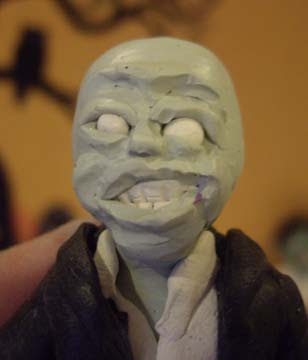 Mix bits of black and green clay into a ping pong ball sized piece of white clay until you have the skin color you want. You can always reserve your zombie skin color for later, but it's not easy to match the color if you run out. Take a marble size piece of skin color rolled into a ball and flatten it to about an 1/8 " thick. Wrap it around the head of your zombie starting under the chin and around to the back. Don't worry about how the back looks, unless your zombie doesn't have hair. Follow the same steps to cover the neck and chest area of the body, assuming of course that you're going to have an open collared shirt. Smooth the neck where you join the two pieces by very gently rolling a knitting needle over the joint until it's no longer visible. 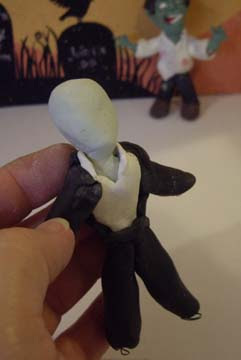 Earl's wearing his day job suit, so I started covering the frame with a basic shirt shape and pant legs. Again, it starts with marble size pieces. Roll each one into a ball then flatten into the shapes you need. Smooth the joints. Use the same method as before to make the sleeves. Take a large marble size of the color that will cover the back, flatten and gently press into place. Take a bit of the shirt and pants colors to make a collar and waste band. Flatten two marble size pieces of pants color into elongated tear drop shapes. 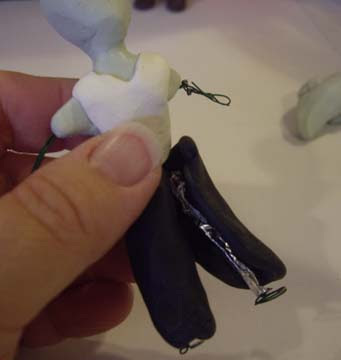 Attach them to the front of the jacket, narrow end up and smooth the joints. Now add bits of the shirt color in the the ends of the sleeves. Stick two balls of your shoe color onto the bottom of the pant legs. 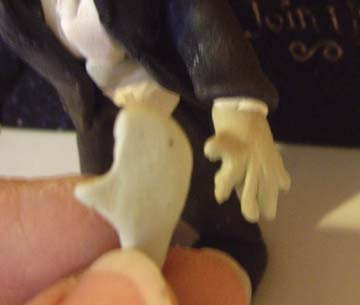 The hands and face are the most delicate so I save them for last. Here's where I add some gore. I pushed some flesh color on the belly and add a bit of shirt color to look like a torn shirt. Roll a small bit of white clay that's wider in the middle than the ends. Press into place with the back side of the craft tool and define the teeth as well. 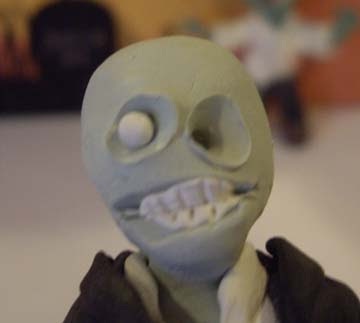 Use the knitting needle to open eye holes. Press in then wiggle a bit to widen. Roll tiny bits of white for the eyes. Place them gently into the eye sockets. The idea is to add eyelids without squashing the eye. 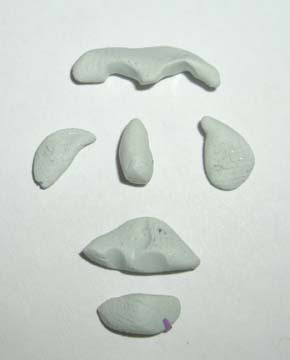 This is how Maureen Carlson lays out the facial features. I just love it! It makes it so easy to understand the face. Make these pieces smaller than you think you'll need them. 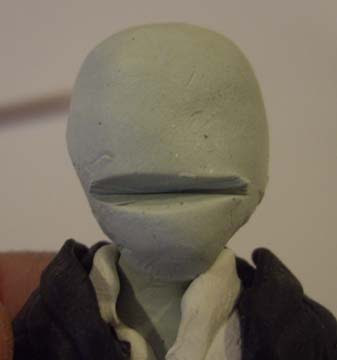 You can always add more clay, but it's hard to take it away without distorting your work. The only thing missing are the upper and lower eyelids. The eyelids are very small and should not cover too much of the eye. Again, very gently put them into place and smooth with the knitting needle. 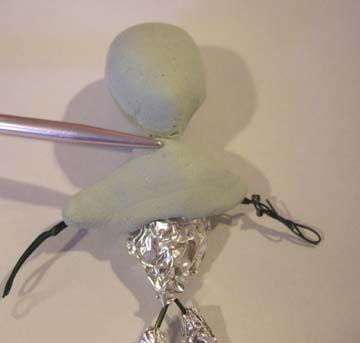 If they begin to cover too much of the eyes, very carefully remove clay with the craft tool. Add the forehead piece and smooth. Now put the nose, lips and cheek pieces on and smooth. Take your time with this, it really gives the zombie character. Now is the time to consider the facial expression. Is he snarling, or do you want his jaw slack? Are there cuts on his face? Maybe he's missing an eye, or even missing one side of his face? Zombie it up! 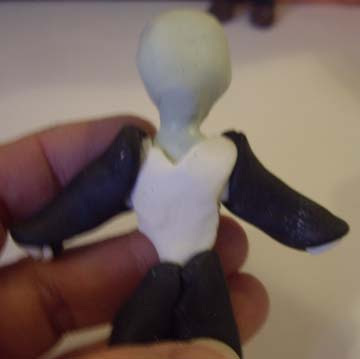 Now make holes in the ends of the arms to attach hands. The hands start as mitten shapes, then use your craft knife to separate the fingers. The Elvis impersonator zombie is missing some fingers. That's okay, too. Body parts fall off. It's a fact of zombiehood. Add hair and then ears. 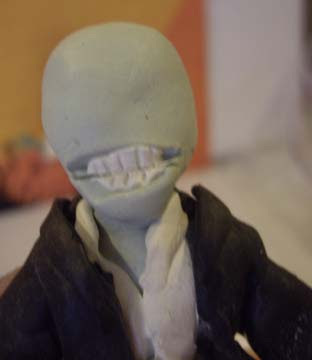 I made the hair colored clay by adding a small amount of white to brown clay. Then I conditioned it, rolling, folding and twisting, until there were tiny stripes of white. It didn't start out to be a mullet, Earl just wouldn't have it any other way. Plus, I have hair issues. Who knows, the next one could have a comb-over. Bake according to the directions of the clay you're using. If you bake him in a toaster oven, lay him down for baking so his head doesn't burn. Ideally, he should bake standing up, but, if you do that, put a Pyrex cup (or other heat safe props) in front and back of him. After the zombie cools, you can use a red gel pen to add blood. This is just half of a folded paper box. I printed a background, tore the edges to fit and marked up the paper with an ink pad.